At Restore SD Plastic Surgery, we offer a variety of financing options designed to assist you with an affordable and convenient means to help you achieve your goals. Cosmetic surgery is a measured and deliberate investment in self-improvement and we want to ensure that offering payment options is a seamless and value-added part of your experience with us. A variety of payment options are available at Restore SD Plastic Surgery to assist you with your surgical needs. We accept Visa, Mastercard, American Express, and payment by cashier’s check, debit card, or cash. We can also assist you in applying for financing through a variety of options including Care Credit and Alphaeon Credit. These financing plans offer easy terms, or low interest rates, and other flexible payment options to best fit any budget. Please email or call us at 858.239.2486 for assistance with your financial needs and to schedule your consultation at Restore SD Plastic Surgery. When it comes to elective cosmetic surgery, patient safety is our #1 priority at Restore SD Plastic Surgery. Every surgery carries a risk of a complication including cosmetic surgery and most insurance companies do not cover medical expenses related to a complication. As a cosmetic patient of Dr. Douglas and Dr. Gallus, your surgery includes CosmetAssure coverage. CosmetAssure provides you with insurance in the unlikely event a complication occurs. 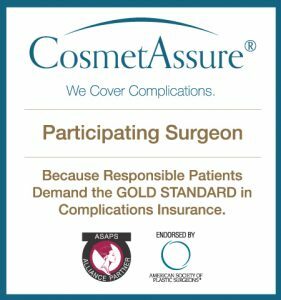 CosmetAssure is exclusively available to members of the American Society of Plastic Surgeons (ASPS) and the American Society for Aesthetic Plastic Surgery (ASAPS). Membership in either of these elite associations indicates that a surgeon’s expertise and credibility have met the highest level of industry standards. By choosing one of our surgeons, you are taking a proactive step to a positive experience and successful outcome following cosmetic surgery. Click here to learn more about this valuable insurance or call us at 858.224.2281 to schedule your consultation at Restore SD Plastic Surgery.